By snapping up the teardown next door, this retired Texas business owner was able to expand her garden to the east side of her Fort Worth home. 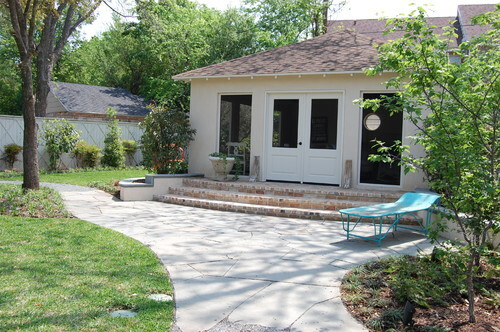 “East-side gardens are very desirable in Texas, due to the intense afternoon sun from the west; now her house blocks this sun,” explains landscape architect Bill Bibb of Archiverde Landscape Architecture. The owner’s charge was that the designers reuse as many materials from the teardown as possible in the landscape design, and put in year-round edibles. The team got creative, using concrete salvaged from the old foundation and the driveway to create a retaining wall and the stepping pads in a new parking area. They turned the old garage into a screened-in porch, incorporated the old metal kitchen cabinets into this space for storage and food prep areas, and even turned porch handrails into a unique bench. 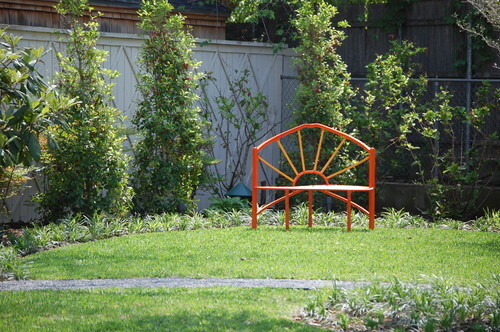 They sourced all of the other garden elements locally, using as many found objects or salvage-shop pieces as possible. The retaining wall is crafted of concrete taken from the teardown’s foundation and driveway. To get her grandchildren, who live close by, and their neighborhood friends involved, the owner invited the kids to insert mementos like seashells, pottery and small toys into the mortar joints. The reclaimed concrete on the wall cap is beautifully chiseled. 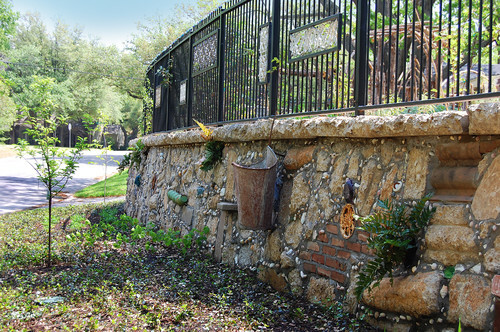 This fence is composed of reclaimed pieces scouted from Architectural Salvage in Dallas. “These were typically what was used to make front porch columns on houses in our area in the ’50s and ’60s,” Bibb says. 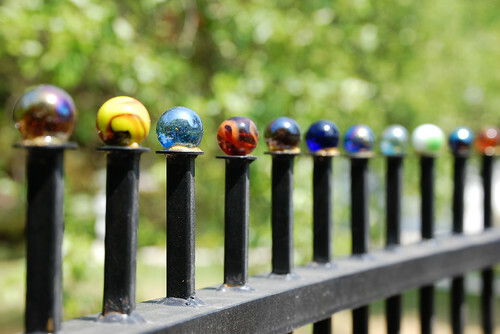 “We left the colors as found and welded them into a simple iron fence.” The finishing touch: a line of colorful finials that are 1-inch glass marbles. 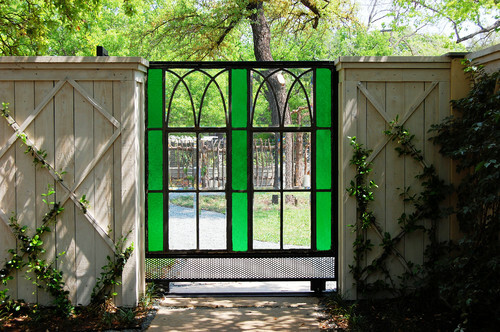 A trip to renowned Dallas landscape architect Robert Bellamy’s studio inspired this stained glass gate. “We tried to buy Robert’s gate, but he would not sell it. Therefore, we had to find a great window and make our own,” Bibb says. The team found this one at an architectural salvage shop and then had the fence contractor transform it into a beautiful gate. “At first we thought it would be cheaper to use the large pieces of broken concrete for a guest parking pad, but we quickly realized the labor factor to move and place such large pieces was extraordinary,” Bibb admits. “Our two-space parking area shrunk to one very quickly. I still love the concept, and the broken concrete has a great patina to it.” He warns that unless you have wide-open spaces and heavy equipment, it is not very practical to carry out this idea. “We chalked that one up to doing the right thing and keeping it out of the dump,” he says. They may have struck out at buying Bellamy’s gate, but they did score a sculpture from India at his place, which they turned into a fountain. They simply placed it on a grate above a buried galvanized metal horse trough, which hides the pump and the light. 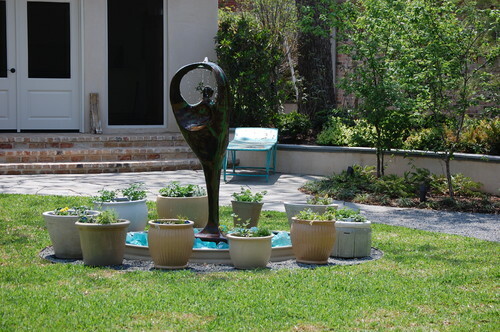 Bibb placed potted plants around the fountain to take advantage of the splash. The plantings are a diverse mixture of fruit trees, vegetables, perennials and hardy woody plants. Finally, they topped the grate with huge chunks of blue glass provided by Bellamy. The former garage from the teardown now serves as a screened-in porch complete with its own patio. The brick used on the porch steps and the steps from the street up to the garden are made from reclaimed Chicago bricks. “I have been told that these bricks were salvaged after the great fire in Chicago in the late 1800s — many are charred on one side, so I tend to believe the story,” Bibb says. The client’s house also uses these same reclaimed Chicago bricks with stucco. 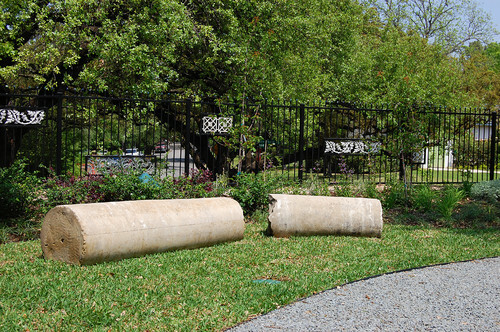 When it broke, this solid limestone column became useless at another job, so in the spirit of reuse, Bibb placed it in the garden as a sculptural bench. “Our client has had bumper crops of every vegetable imaginable and is glad to share them with friends and neighbors,” Bibb says. 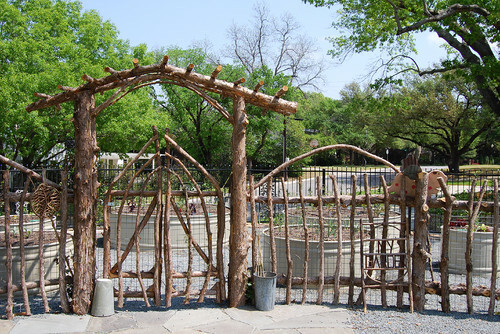 Adirondack stick style inspired the eastern red cedar fence around the edible garden. The vegetable beds are round galvanized steel horse troughs with the bottoms cut out to allow for good water and oxygen exchange between the imported soil (which contains about 30 percent shale for drainage) and the native soil below. Each bed is irrigated with a drip line that can can be adjusted or turned off as needed.